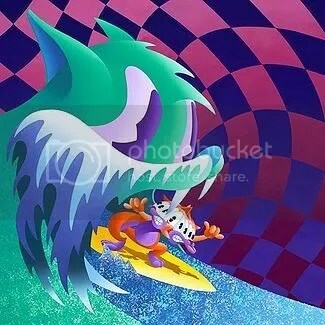 Ironically enough, after MGMT/Sony Records announced they were pulling the plug on the planned full stream of “Congratulations” (which was due to be available on Monday), the reasons for which neither the band nor the label explained, “Congratulations” leaked. Below that little message, you can stream the whole album for free. Is there any connection between cancelling the planned stream and the album leaking? It all seems a bit strange to me. If I was to guess at anything, I’d guess at this. I’d guess MGMT may not be too happy about that, and may have taken matters into their own hands. As the album would be under very tight security, I can’t imagine too many people having access to it. Maybe MGMT thought “Okay, we value our fans a lot and we want them to hear our new album before they go out and buy it,” and so they decided to leak it. The leak then forced the label to agree to put a stream up, because if there’s no legal stream, people are more likely to just download the album, which is bad for them. Alternatively, MGMT wanted to give their album away for free from the get go, but couldn’t because their label logically wouldn’t want that. The next best thing was a pre-album-launch stream, but when that was cancelled the band had no choice but to leak it. So maybe MGMT do want people to pirate “Congratulations”. They said they want the album to be a free download. But it doesn’t matter, I doubt we’ll ever find out. That’s all just speculation. Something to think about. It just seemed a bit odd to me and the more I thought about it the more it seemed like it could be a deliberate leak. Also; in related news, apparently they’ve “apologised” for “Flash Delirium”. Read about it here. Oh, and by the way, the album doesn’t sound bad at all. It’s more out-there than “Oracular Spectacular”, but I expected that. If anything, it seems to flow together well as a whole. So it may not be an album of radio-friendly singles, but as a full album it could be quite good. I guess time will tell with repeat listens. Next postBRAND NEW: The National – "Bloodbuzz Ohio"